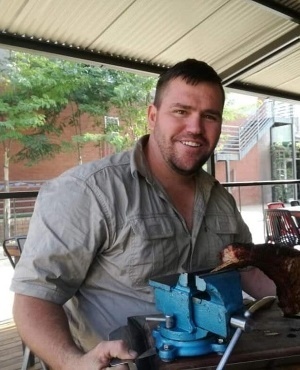 A close-knit Mpumalanga farming family is coming to terms with the loss of their beloved son and brother who’s been electrocuted on the farm where he lived and worked. “You can’t make sense of something like this. At this point it feels unreal,”Jandré’s eldest brother, Jaco (34), told YOU this week. Jaco says Jannas, as the family called Jandré, wasn’t someone who’d let others tell him what to do. Jandré, a former pupil at HTS Middelburg, was a passionate veggie farmer and golfing enthusiast and had a wicked sense of humour, he said. The accident happened while Jandré was checking a faulty water tank. Their youngest brother, André (21), was with paramedics when they tried to revive Jandré, who died at the scene. Jandré and André, who returned from a working stint in America last year, had started a veggie farm, growing mainly tomatoes. Gavin Cooper, a seasoned paramedic who attended the accident scene, posted a picture on his Facebook page of the two water tanks and warned people of the dangers of high-voltage power lines. He also wrote about the moments when he realised they’d lost Jandré and how André had fought for his brother’s life. “The resistance I felt in powerful young hands, gripping the BVM [ventilation mask] trying to ventilate his brother while we perform CPR. I gently took hold of his brother’s hands as they started to tremble, moving him away from the airway. Jaco says their parents, André and Elna, who also live on the farm, are heartbroken. Jaco is also survived by his sisters, Tarien (23) and Tania (19). Tarien, who works in New Zealand, will return to SA for the memorial service.